I'm trying to crochet. I tell a friend. She says, "But if YOUR Grandma taught me, what were YOU doing?" Ha ha ... sounds like a wasted opportunity back then (but how generous of your Grandma to teach someone else!). Glad you are making up for lost time. Ha! I really wish I'd asked mine to teach me, while I still had that chance, although she did try with knitting and I was a disaster. Looks like you're doing pretty well there. Brilliant! Love the fact that your Grandma taught one of your friends, but not you! What a good question - do we get to discover the answer? Whatever you are creating looks good tho'. Having fun I should think :) Love it! LOL! What a great story (told succinctly). I posted two photos today - one just for you! Ha, love that! And exactly what were you doing??! What a precious legacy from your grandmother! LOL! Yours is the second of these posts that brought a smile to my face and a good chuckle! That is a good question! My grandmother taught me to crochet as well. I would love to learn to crochet so well done you! And do you remember? And are you going to tell us? Lovely mini story and beautiful crochet :). Beautiful crocheting... and what was YOU doing back then? well done on mastering the crocheting. I'm envious, I can't get beyond Granny Squares! Ha! Yep. Exactly how I feel about wishing I'd paid closer attention to my Mum's knitting advice! I was always too busy to learn from my mum and older sisters! This looks pretty impressive to me, Sian! Haha - adorable, Sian. And I love the way you have photographed this! I can crochet (sort of, as long as it's a large-ish pattern), but knitting is a mystery. Cross stitch, with adequate lighting and magnification, is my needleart of choice. 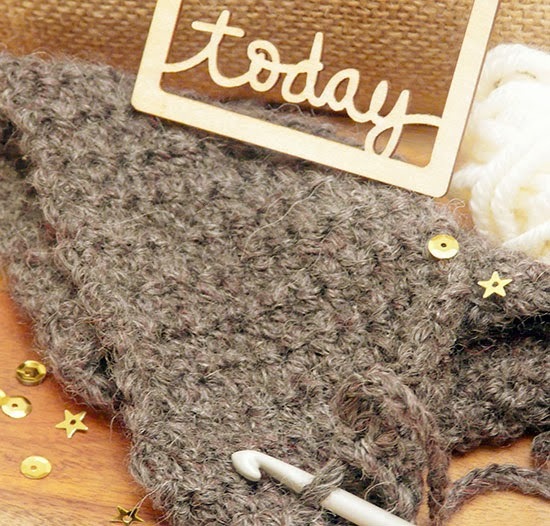 Wishing you success with your crochet adventures. What a great story in so few words! I find it very therapeutic having recently gone to class to learn. Nanna tried to teach me back then but I didn't want to know! He he! I can knit and really want to learn to crochet. i feel i lack the patience though! Thanks for joining in Sian!